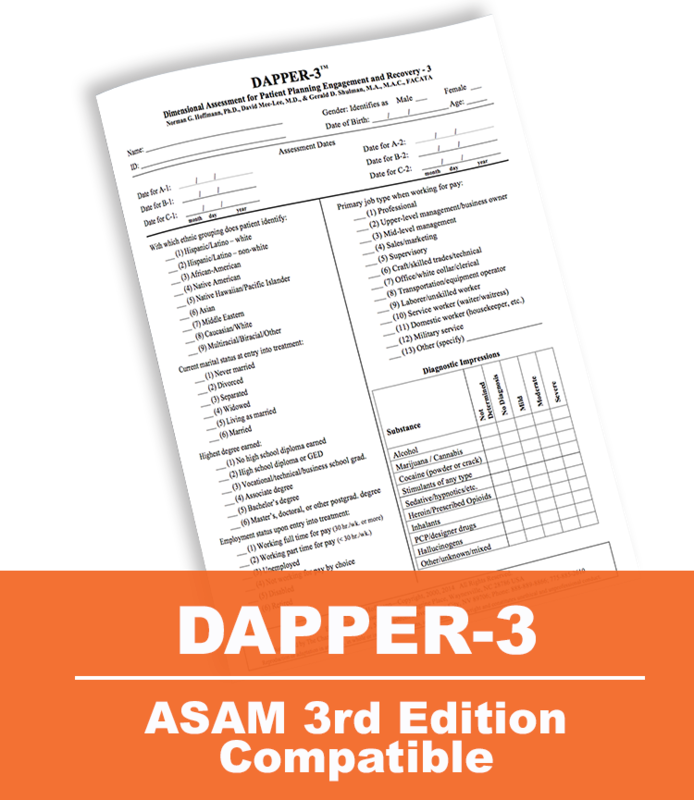 Coinciding with the 3rd edition of The ASAM Criteria, the DAPPER-3 is designed to facilitate truly individualized treatment planning by focusing the clinician’s attention on those factors that either require immediate attention or should be considered priorities for the treatment plan. 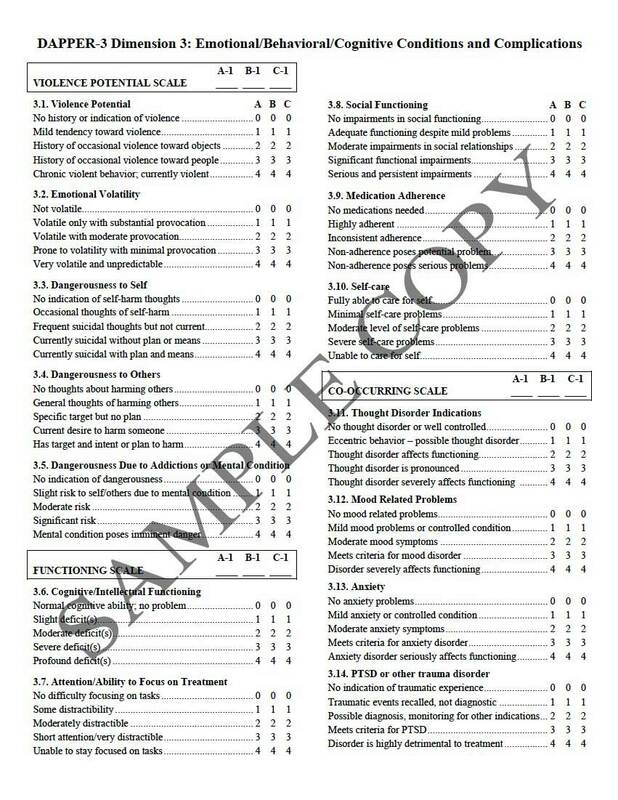 The emphasis of this rating design is on identifying and documenting severity within a given ASAM dimension, not a normalized "score" based on an average. This allows each individual to receive the specialized and specific treatment they need throughout all stages of treatment. 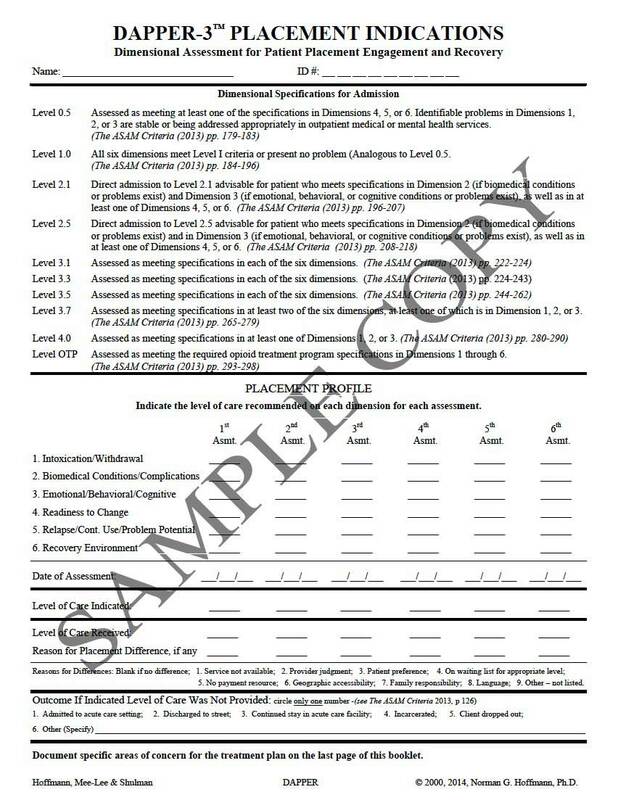 The DAPPER-3 rating design facilitates continued care by offering up to five additional ratings to determine if desired changes or improvements are evinced during the treatment continuum. 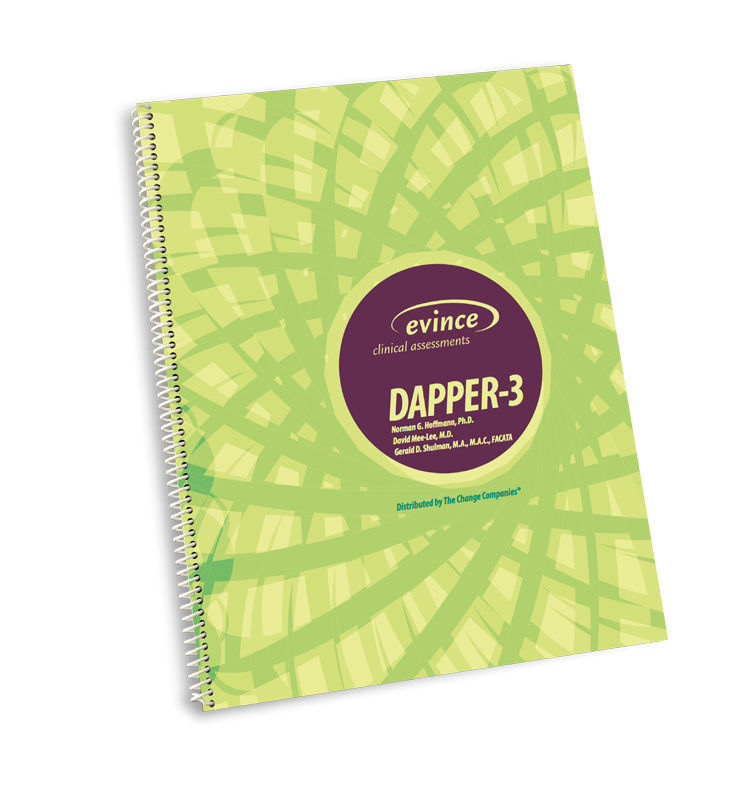 In short, the DAPPER-3 can help design the initial treatment plan as well as indicate whether the plan is working. Individualizing treatments in light of individual needs is important irrespective of the overall treatment approach. 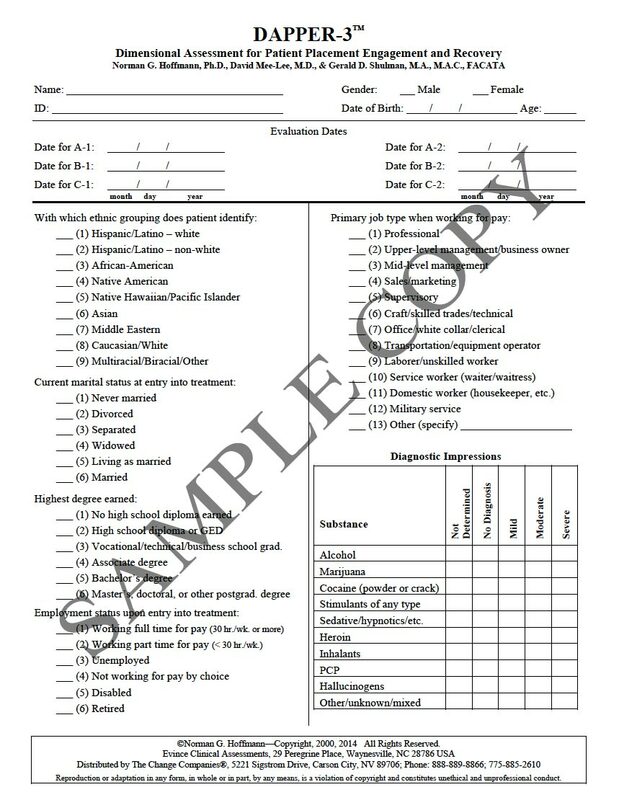 This instrument can be used as a semi-structured interview for routine clinical work or staff training. At clinic intake to document strengths and problem areas as part of treatment planning and placement. Clinical management tool to document current status and treatment progress over time. 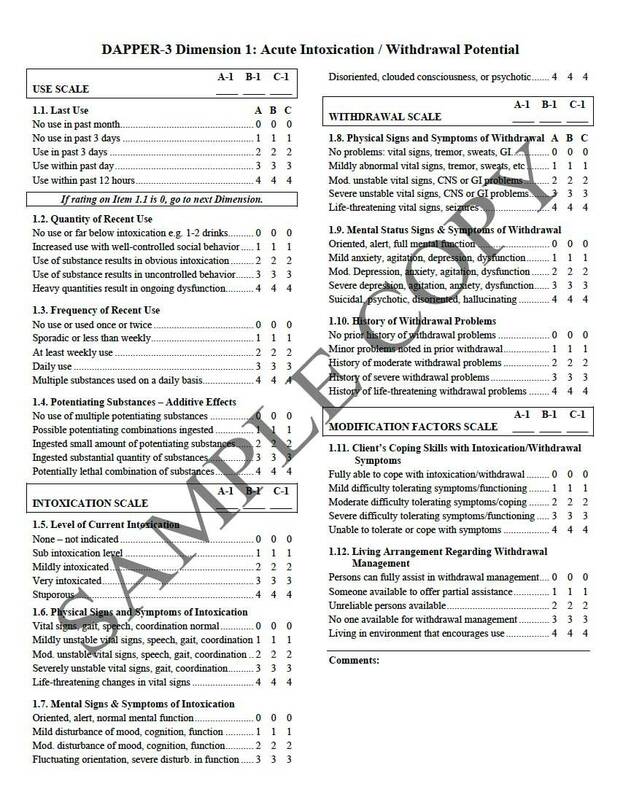 Ideal for training and educating staff on the assessment and reassessment process utilizing ASAM's six dimensions. Practical for monitoring status for longer programs such as those associated with drug courts. Appropriate for adults and adolescents. Focuses attention on those areas requiring the most urgent need. Provides a foundation for formulating reports and communication with other professionals.